Our tutors are all experienced artists and makers in their own right; they bring their specialist knowledge and expertise to the courses and workshops they teach here at New Brewery Arts. The process of creating an animal out of a wilful bundle of wool or deadweight of clay seems to me fascinating and absurd in equal measure. She enjoys passing on skills and knowledge of stone and the tools needed to work this fascinating material. Her work ‘Passing Light’ was part of the Quarry Garden at the RHS Chatsworth Flower Show 2017 which won Gold for best in show and best construction. Patricia van den Akker is the Director of The Design Trust, an online business school for designers and makers. She has been working as a creative business adviser, trainer and coach with 1,000s of creative professionals for over 20 years. Dawn has exhibited widely, her work features in numerous collections including the Crafts Council and the Victoria & Albert Museum. Jayne is a multi-media textile designer who trained at Central St Martins. She sells her textile designs to clients ranging from Topshop to Chanel. 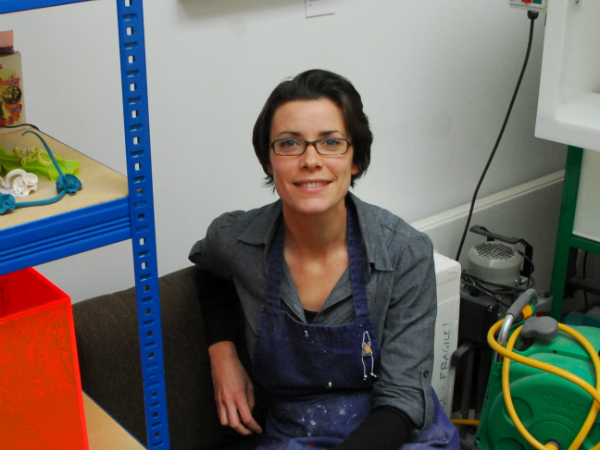 Emily is a sculptor and installation artist based at Stroud Valleys Artspace. Julia is an award-winning botanical artist and experienced tutor, She enjoys depicting the beauty and detail of nature in watercolour and is particularly drawn to subjects such as fading flowers and autumnal leaves. Jo creates ornamental ceramic sculptures at her studio in Wiltshire and regularly exhibits her work - recent shows include Fresh Air at Quenington, 'Hospitality' at Bath Abbey and a solo show at Bath's Holburne museum. With an education in textiles and fine art, I always feel drawn towards mixing materials through print, painting and assemblages. 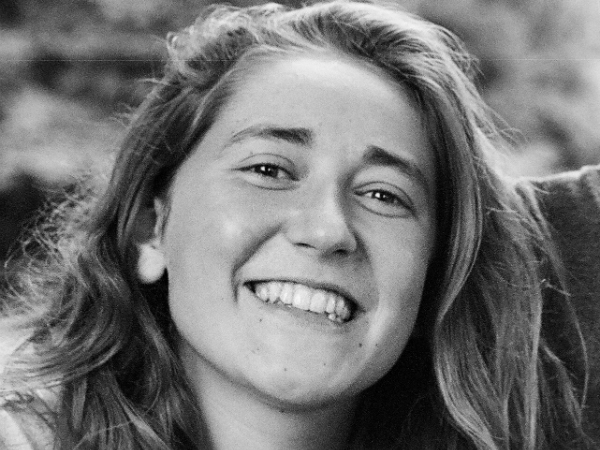 Hannah makes sure children of all ages and abilities have fun experimenting, realise their creative potential, unleash their imaginations, and develop as young artists. Karin lives in a small house in Monmouth, Wales. In her garden there is a shed and in that shed there is another world. Claire applies both modern and traditional theory and practices to her teaching. Her courses mainly study from life but students are encouraged to research artists, materials and techniques from a wide range of disciplines. Josie has taught lettering, lots of decorative processes and making books for many years - but is passionate about bringing ancient techniques to contemporary usage. Yvette works primarily with stained glass and glass inclusions and produces mosaics for all areas of the home, specialising in garden mosaics. Her work is inspired by the intense colours of nature and her love of the outdoors. Abi hand builds her work predominantly using slabs and specially constructed moulds and formers. She is particularly interested in texture, colour, form & function. Mark is known for his free approach to painting and drawing. He likes to have fun with colour and experiment with techniques. Christine teaches screen printing, photo etching, reduction lino printing and monoprinting. She is printmaking tutor and Chair at Gloucestershire Printmakers co-op. 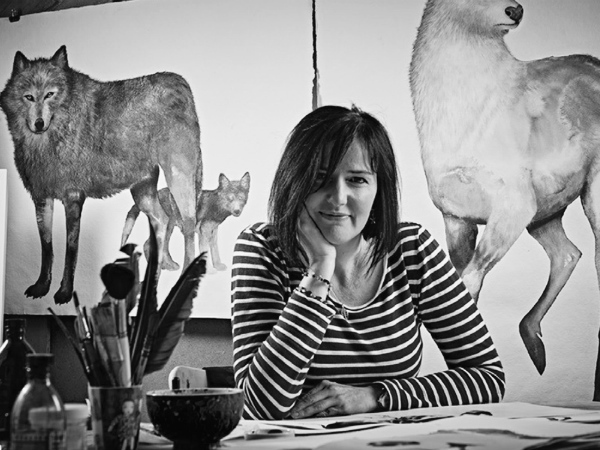 Lorraine combines a love of drawing with work which is inspired by the animals and natural world that surround her home. Sophie Howard is an artist who makes expressive figurative sculpture. She has thirty years of teaching experience most recently at Bristol's Royal West of England Academy. Kathleen's one-of-a-kind pieces are created using recycled fabric, hand embroidery and found objects. Peter hand builds sculptural and functional pieces for the home and garden from his studio in Gloucester using a range of coiling and slab building techniques. Clare is our Education manager but also a talented textile artist. Clare has always had a love of Textiles, dressmaking, felt making, silk paper making and printed textiles are particular interests and a passion for colour and texture inspire her work. With a strong belief in the power of the written word and a lifelong love of books, Emily has been making her own books since childhood. Today her custom made journals and sketchbooks are sold internationally. Meg describes herself as a print and pattern addict. She uses a domestic sewing machine to create freehand machine embroidered pictures of local architecture and also takes inspiration from everyday objects. Julie Fowler is a Stroud based ceramic artist who combines teaching and her own studio practice. Ceramics has been a life long passion and she enjoys sharing her enthusiasm and skill on this continuing journey of discovery..
Rebecca designs woven textiles and hand-weave cloth. Her designs can be woven in a range of weights; for rugs, upholstery cloth, soft-furnishing or for accessories such as scarves. 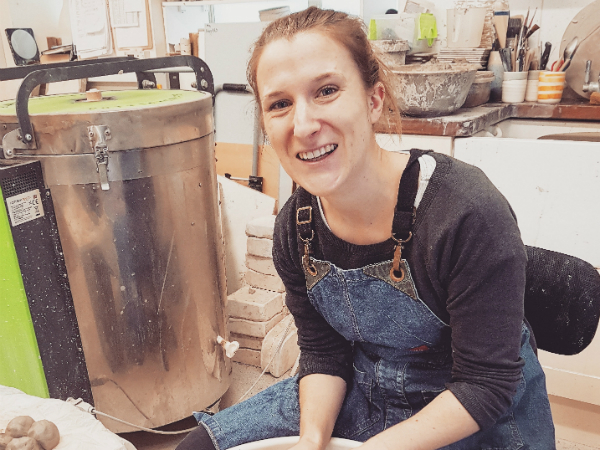 Aimee is a ceramics artist and is continually interested in themes of other-worldliness; natural forms that are inspired by science, fiction and non-fiction. Georgie is Founder and Creative Director at The Paper Hare an Illustration & Lettering Design Studio just east of Cheltenham. Hi, my name is Imogen and I am a drawaholic. I am an illustrator Drawing is my go to for pleasure, situation sorting and work. I draw each day and I have a favourite pencil. My graphic style is honed, heartfelt, honest and direct. Richard makes Shaker style boxes from his workshop in Dorset. All the boxes are made using English hardwoods that are sourced from around his home. I was born in London. I studied Theatre Design at Central St. Martin’s College of Art & Design. After graduating, I worked as a Designer and Art Director in Theatre, Film and TV for more than 15 years. Bridget has been a professional potter and teacher for over 30 years. Most of her work is thrown on the wheel to make pots for domestic everyday use. Fiona runs adult classes in Art History in Cheltenham and organises cultural trips. Her particular interest is in nineteenth century art, The Renaissance and Modernism especially are her favourites. Emma Barnes, the Creative Director behind Emerald Paper Design has been a graphic designer for 7 years, working on a number of packaging & branding projects for household names. “I absolutely love what I do! Each day is different" - Emma. Justyna Medon is a surface designer specialising in bespoke printed textiles and wallpapers, and head of Addicted to Patterns studio, based in Bristol. 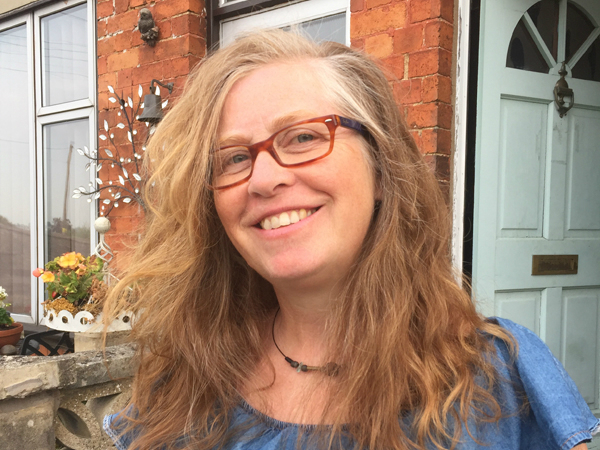 Libby works from her studio at The Pound Arts Centre in Corsham where she continues to develop her practice selling to over 20 stockists in the UK and continuing to teach classes regularly. Suzi was commissioned by the Royal Horticultural Society to create the very first RHS garden made entirely from paper. Suzi's paper plants and flowers were exhibited at the Gardeners World Live Show at the NEC Birmingham. Shortlisted for Artist & Illustrator Artist of the Year 2016. DJ has developed his style through many years working in professional fine art studios – designing and producing artwork for commercial spaces, public areas and private estates around the world. Neon Workshops specialise in the development and manufacturing of neon lighting for the creative industry. Their regular delivery of neon sculpture courses, whether in their studio in Wakefield, or a Mobile Neon Workshop, continue to attract participants from around the world. Lizzie is an Illustrator and Print-maker currently in her final year at Bath Spa University studying Graphic Design and Illustration. She also works as a children’s art and craft tutor. Inspired by the architecture and life of the town, he has become a familiar figure painting the city's streets as well as in all the other cities and towns in which he now works. Francesca if a figurative artist. 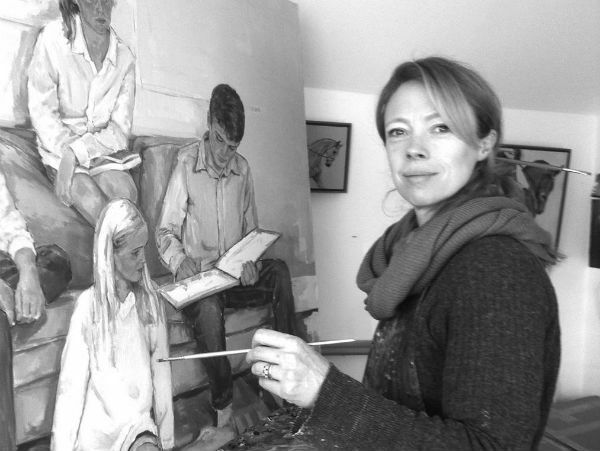 She has become a member of the Royal Birmingham Society of Artists. She has had her work shown at the Mall Galleries London, Blue Tree Gallery York, and the Noott Gallery Broadway as well as taking on many private commissions. Mandy work primarily in anodised aluminium producing one off and batch production jewellery. Adele, a Fine Art Printmaking graduate from Brighton and a qualified Teacher, brings a wide range of skills and experience of working with all ages to her workshops. Jules is now a full time paper artist where she creates stunning wedding flowers and bouquets for brides, backdrops for catwalks and photography props as well as the more simple versions that stand proud in a vase on the table. Sophie loves to inspire creativity and play through sharing her creative printmaking technique with people of all ages. She developed her process whilst studying Illustration at The Arts University Bournemouth. Christine has spent time living and working in Mexico, this inspires her greatly in her craft making which ranges from mask making, the Mexican craft of Hojalata (tin work), and silk painting.